On September 1, Consul General Hong Lei visited the City of Indianapolis, the State Capital of Indiana, and met with Mayor Joe Hogsett. Consul General Hong Lei said he was very glad to visit the beautiful city of Indianapolis. Currently, Indiana’s trade and investment cooperation with China continues to expand. More and more Chinese enterprises and students take Indiana as a destination of investment and further education. The sister-city relationship between Indianapolis and Hangzhou in Zhejiang Province enjoys sound development. China’s economy is now maintaining rapid development, which will provide more opportunities for cooperation between the two sides. The Consulate General would like to join hands with Indianapolis City Government to further promote mutually beneficial and win-win cooperation. 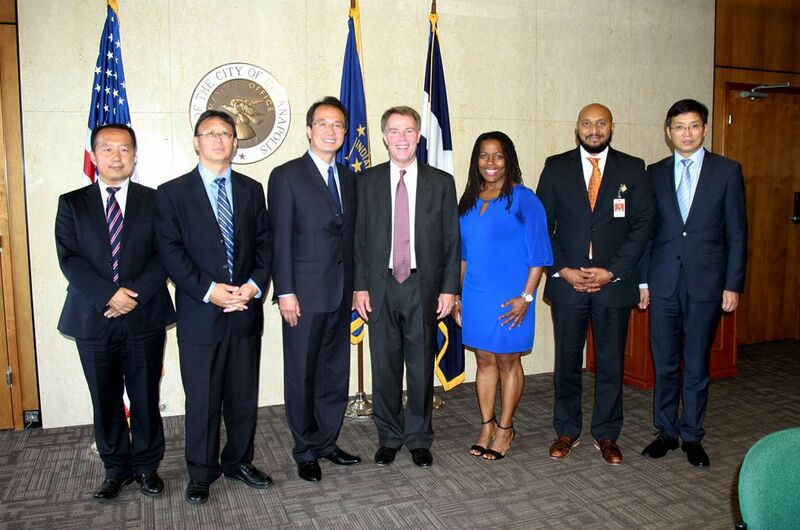 Mayor Hogsett warmly welcomed Consul General Hong Lei and spoke highly of the progress of Indianapolis-China cooperation and exchanges as well as the contribution that the Chinese community and students had made to local economic and social development. He said that Indianapolis regards China as an important partner and welcomes more Chinese enterprises and students to the city. He looks forward to an early visit to China so as to further deepen exchanges and cooperation with China in various fields. Deputy Consul General Yu Peng, Deputy Mayor David Hampton, Deputy Mayor Angela Smith Jones and Mayor’s Chief of Staff Thomas Cook were present at the meeting.